Commisserations and Congratulations to Tom Forrest (right), Tour Development Manager at Vinopolis in London, who just missed out in the grand final of a competition to find the European Champagne Ambassador for 2007 in Epernay last week. 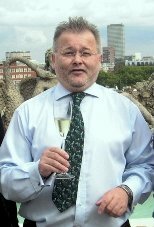 Tom retains his national title as UK Ambassador for a full year however, as in September he overcame stiff competition in a series of tastings and question and answer sessions to prove he has a formidable knowledge of Champagne and its wines. Tom just missed out in the week-long finale to the competition last week, the European title going to Ingeborg Aug of Germany, a tutor at Hamburg’s catering college. All eight contestants had to convince a panel of judges that they had the tasting and teaching skills necessary to claim the title. 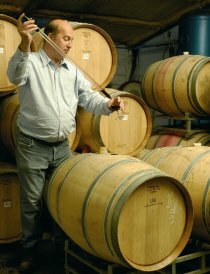 Read the full story of the competition – or register for next year’s – atambassadeurschampagne.com. Vivabox have teamed up with Oddbins to create a range of products designed for the gift market in the run up to the festive period. The Champagne Vivabox is basically a sampler box containing four quarter bottles of different Champagnes, along with a redeemable voucher for a full size bottle of any one of the four samples: the idea is to give the Vivabox as a gift, allowing the recipient to taste the wines at their leisure before choosing their favourite and picking up a full-size bottle from any Oddbins store. The Champagne Vivabox costs £45.00, and there’s a Whisky version with miniature malts at £30.00. Harveys, the UK’s best selling sherry range, now has an “exciting and contemporary new look,” in time for Christmas 2007. The re-design is meant to mix tradition with the contemporary design, and the ubiquitous ‘Bristol Cream’ – only one of three different sherries in the Harvey’s stable – will come in am “iconic bright blue” bottle, to be joined by Pale Cream in a “leaft green” bottle and Harvey’s Amontillado in a “glowing amber” bottle, each is colour coded as part of the packaging overhaul. 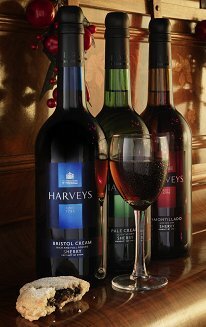 Harvey’s Bristol Cream is the overall brand leader in the sherry category, with 30% market share by both volume and value. There is also a preium range of Harvey’s sherries, including a Fino, Palo Cortado and Rich Old Oloroso. All three variations of the standard sherries are available in Tesco, Morrisons, Sainsbury’s and Somerfield, with Asda, Waitrose and the Coop stocking one or two of the wines. The Kent village of Tenterden is hosting its first ever Food & Drink festival this weekend (November 3rd and 4th), celebrating local produce and showcasing what the area has to offer to visitors, including the award-winning Chapel Down Winery (left) at Small Hythe. A tented food village will be brought to life on a green just off Tenterden High Street, with a marquee housing a number of local producers and retailers. Stalls include: Gibbet Oak farm Shop selling fresh fruit and juices, as well as Silcox Farm Shop’s home-made sausages. There will also be a special theatre area where local producers will be giving talks and tastings, including celebrity cook, Mary Berry, talking on classic English cooking. It is said that to travel is better than to arrive, but as English explorer Jason Lewis discovered on the completion of Expedition 360, there are some benefits to coming home – including this magnum of Champagne Taittinger Brut Reserve. 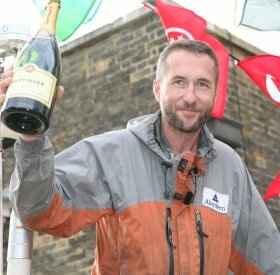 Jason and his international team celebrated a record-breaking circumnavigation of the globe, made by human power alone. Moksha, a pedal-powered vessel figured centrally in Expedition 360, reaching antipodal points on the surface of the globe via human power alone. This impressive adventure began in 1994 and has taken thirteen years to complete, involving every conceivable mode of human-powered transportation from bicycle and in-line skates to kayaks. Covering in excess of 45,000 miles, the years have involved thousands of hours of walking, swimming and navigation to cross five continents, two oceans and one sea – without resorting to either motor or wind power.